On Thursday, the Heinz Family Foundation honored pediatrician and public health advocate Dr. Mona Hanna-Attisha by making her the recipient of the 22nd Heinz Award in the public policy category. The accolade includes an unrestricted cash award of $250,000. Hanna-Attisha is being recognized for stepping forward to expose the elevated lead levels in children in the city of Flint, Mich.; for the work she put into establishing a comprehensive care and support system for children and families affected by lead exposure; and for igniting a renewed nationwide conversation about lead exposure and drinking-water safety. As part of the honor, the doctor will receive an unrestricted cash award of $250,000. 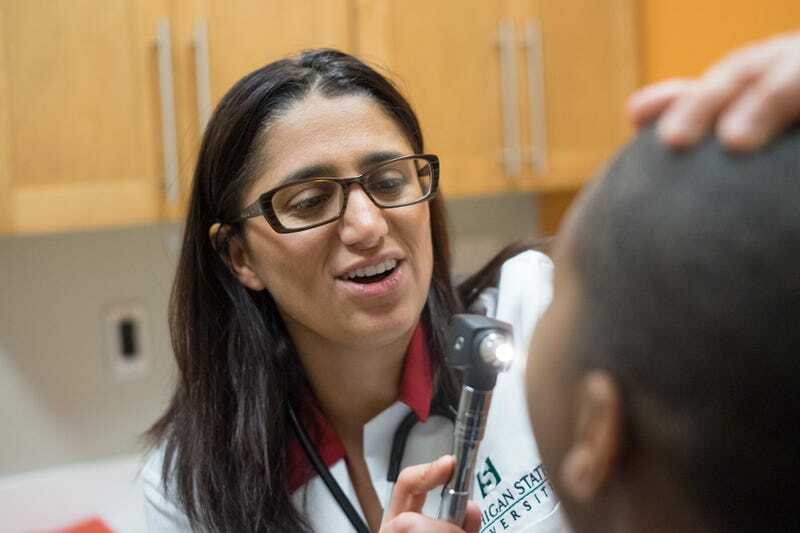 Hanna-Attisha is the director of the pediatric residency program at Hurley Medical Center in Flint and an associate professor at Michigan State University College of Human Medicine. In 2014, shortly after the city of Flint switched its water supply from Lake Huron to the Flint River, residents in the city began complaining about the pungent brown water flowing from their faucets. Although state officials maintained that the water was safe, Hanna-Attisha was not convinced. She had previously studied findings by leading lead researcher and Virginia Tech civil engineering professor Marc Edwards, which indicated that the untreated water in Flint was 19 times more corrosive than the water that had been previously sourced from Lake Huron. Hanna-Attisha told The Root: “When anybody in pediatrics or public health hears the word ‘lead,’ it’s a call to action. We know the science; we know what lead does. It’s an irreversible neurotoxin. There’s huge environmental injustices already with lead. Our country’s most vulnerable children already have higher rates of lead exposure. Hanna-Attisha immediately went to work and analyzed data on 2,000 pediatric patients before and after the switch. Her research found that the percentage of children with elevated levels of lead in their blood had almost doubled since the switch, and in some neighborhoods, it had even tripled. “Contrary to what was happening across our nation—where the percentage of children with elevated lead levels had been decreasing because we got lead out of paint and out of gasoline—every year in the nation, in our state and even in our city, the percentage of children with elevated lead levels was going down,” she said. That research was done in 2015 at “record speed,” she said. Because Hanna-Attisha knew this was a public health emergency, she decided to go public with her findings. Initially, state government officials tried to discount her research and undermine her credibility. The public outcry and national media attention that was generated by her findings forced the state to re-evaluate its data, however, and both Michigan Gov. Rick Snyder and then-President Barack Obama declared a state of emergency for the area. Hanna-Attisha said that although research results are not normally shared at a press conference, she felt that she had no choice because the families of Flint needed and deserved to know what was going on. She released her findings at a press conference in September 2015. Since then, Hanna-Attisha has remained at the forefront of efforts to change public health policy on both the local and national levels, and to meet the needs of children and families who are being impacted by exposure to lead. In 2016 she became director of the newly created Pediatric Public Health Initiative, which is an interdisciplinary collaborative effort between Michigan State University and Hurley Children’s Hospital. The program will provide tools, resources and interventions for improving the health and development of children affected by lead exposure, and it will monitor those children and their families for years to come to assess the effectiveness of those interventions. “With PPHI, we are actively trying to flip the story for our kids,” Hanna-Attisha said. “We are doing work that hasn’t been done before. We very much know what lead does—that science is there. We know what it does to cognition, to behavior, to criminality and to life outcomes, and leaning on the field of developmental neuroscience, we are proactively intervening to preserve the tomorrows of our children. “Everyone in Flint—community partners, moms, kids, nonprofits—is rolling up their sleeves to make sure that our kids turn out OK, and really better than OK,” she said. “We have been able to establish free, year-round child care. We are the only city to have universal preschool. We have Medicaid expansion, we have mobile grocery stores, we have breast-feeding services, mental-health support and positive parenting programs. To that end, Hanna-Attisha is coordinating the establishment of a registry that will track the children of Flint who have been exposed to lead. She was appointed to the 15-member Child Lead Exposure Elimination Commission, which has recommended the mandatory testing of all children for lead poisoning, expanded home-testing requirements and the creation of a statewide database of structures with dangerous lead levels. Hanna-Attisha considers the Heinz Family Foundation award to be a huge honor. “It’s humbling and it’s an incredible honor to receive this award. It’s prestigious in academics, and it means so much to me because one of the first people to receive this award was a pediatrician named Herb Needleman,” she said. Hanna-Attisha also believes that the award is an excellent way to remind people that the crisis in Flint is ongoing. More than three years after it first began, the people of Flint still do not have clean water in their faucets. The Heinz Awards were established to honor the memory of U.S. Sen. John Heinz. The awards have recognized 133 individuals and awarded more than $26 million to its honorees. For more information about Dr. Mona Hanna-Attisha and other Heinz awardees, visit the foundation website.